A couple years ago I started watching a new show on the CW network, Arrow. I watched for one reason alone – John Barrowman. Barrowman starred as Captain Jack Harkness on BBC’s Dr. Who and Torchwood. It was a great character, and I figured his presence alone was a good reason to give this little comic book show a try. I enjoy action movies, and I can recognize Stan Lee, but I know nothing of this particular comic series. The show immediately engaged me apart from Barrowman’s presence, and the appearance of a new character, Felicity Smoak, several episodes in had me riveted to the television. Apparently, this character does not exist in the comic world, and was meant to be a one-off, but the response by fans was so positive that Emily Bett Rickards quickly became a series regular. Smoak is a beautiful blond, but this fact is superfluous to her character. She is a genius-level tech whiz. She can hack anything on earth in just a few seconds, and throw in some amusing asides while barely batting an eye. Felicity falls for the lead character, Oliver. Since she’s the geeky tech girl, and other women seem to catch Oliver’s eye, the audience could only ship these two. That was until the end of last season, when we realized Oliver was a smart man after all and fell for Felicity. This is tv, so naturally the course of true love does not run smoothly. Felicity yet again proves that she is not the typical young woman on an action show. She loves Oliver, but she also loves herself. Oliver is an imperfect hero, and makes plenty of mistakes. And you know what? Felicity is not going to allow her life to be ruined by the man she loves. Oliver decides to join forces with the evil Merlin (for good reasons, but does the end truly justify the means? ), and Felicity wisely refuses to be part of it. She reminds Oliver of what happens to the women he loves, especially when he strays from the path of goodness and integrity, and she refuses to be a woman he loves who gets destroyed. I literally cheered at the tv when she took her stand. I have always loved this character, but how many times have we seen stories where the women love the guys regardless of any stupid or risky actions. They practically sing “Stand by your man.” Romantic love is the most important thing. Reason is trumped by love, even to ruin or death. 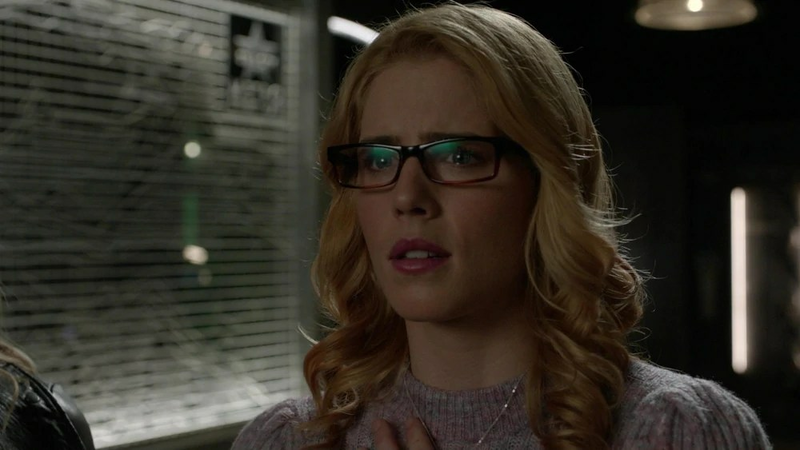 Felicity loves herself enough to know that she deserves better. She deserves a man who will act with integrity. She deserves a man who will not ask her to go against her conscience. Yes, she loves Oliver – but this by no means negates the love she has for herself. Felicity is a role model. She’s proud of her smarts. She has a great sense of humor. She works hard. She expects a great deal from herself and from others. And she will not settle for anyone less that who she really deserves.